Why is the infrastructure in the most wealthy country in the world crumbling? President Trump made many campaign promises on his path to the White House. His statement that we need to have a massive push to infrastructure spending was one of the few promises that I happened to agree with. “We have a great plan and we are going to rebuild our infrastructure. By the way, her [Hillary Clinton’s] numbers is a fraction of what we’re talking about, we need much more money than that to rebuild our infrastructure.” — Donald Trump, Aug. 2. Unfortunately, he plan’s to privatize the work. The work will not be regulated and funded as it traditionally has. Instead, he will offer tax credits to big developers and investors. The problem with this concept is once again it will hurt everyday Americans, while simultaneously lining the pockets of big corporations. The way the tax credit will work is, for each $1 that is spent on this project these private investors will be paying only $0.18 cents. The other $0.82 cents will be given by the taxpayers. These private companies will also levy fees on this work such as tolls, water fees, wiring fees, and pipe fees. So in effect, the American public will have to pay these pirates twice. 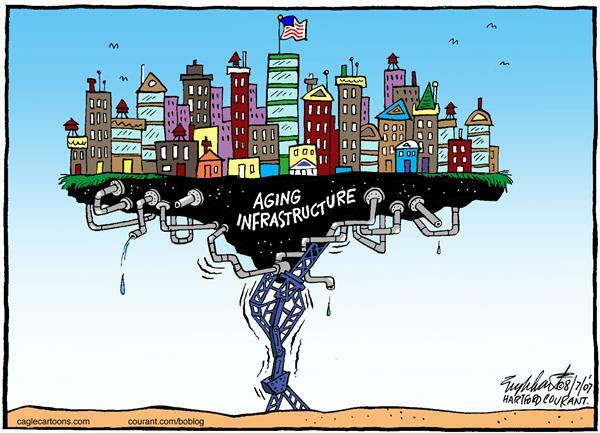 The worst part however is, with the privatization of the work, we as a country will get the wrong infrastructure. These large corporations will focus on massive jobs that will pay large amounts in fees and tolls, such as Mega Projects like new throughways and bridges. All the while they will ignore the projects in the rural USA and the small towns like my own. Projects needing to be updated bad, like airports, small bridges, water treatment facilities, clean energy projects and pipe systems like those needed in Flint Michigan. We are in dire need of an infrastructure overhaul, on that front President Trump is correct. To really do it correctly, we need more and better infrastructure that is for the public, not big investors and developers. The only way we get that is if corporations and the wealthy pay their fair share like the rest of us.